The victorious COPS A squad. 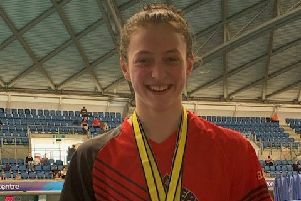 City of Peterborough Swimming Club (COPS) are once again celebrating a massive victory in the National Arena Swimming League. The city club made it through to the national final in Cardiff - the FA Cup Final of swimming events - in style by clinching the East Midlands Premier League title in Coventry over the weekend. They won the final round of three by a huge 41-point margin to claim their third East Midlands Premier League title in four years. They went into the third round in second place behind Northampton, but a superb effort from all age groups saw them finish top in the overall league standings to clinch a coveted place in the 2015 national final. The final scores at Coventry were: 1 COPS 245pts; 2 Northampton 204pts; 3 Milton Keynes 185pts; 4 UEA Norwich 145pts; 5 West Suffolk 135pts; 6 Nottingham 130pts. COPS won an impressive 24 of the 50 races and finished with podium places in 43 of those 50 races. And for the first time in COPS’ history both the ladies and men’s 6x50m freestyle relay teams won their events. The stand-out age-group for COPS was the 15 years & under girls, where they won every event. The open girls, 13 years & under girls and 15yrs & under boys all finished in the top two in their respective races. Team captains James Newton and Taylor Goodby picked up the East Midlands trophy. Head coach Ben Negus said: “I was absolutely delighted with our team’s attitude. The sheer determination of our swimmers to finish on that wall before anyone else was excellent and in the end it crushed our opposition. “It just goes to show how important it is to pull together for your team-mates and perform your best without doubt and with total conviction. The COPS B team meanwhile finished second in their final fixture in Division Two to claim third place overall, just missing out on promotion. There were individual wins by Josh Graves, Amelia Monaghan and Daniel Powell with the boys 13 & under relay team of Herbie Kinder, Matthew Wouldham, Henry Pearce and Sean Doyle winning both races.